A couple of years ago I went to the Congo, to an isolated, uneasy spot called Gbadolite on the Ubangi River, hundreds of miles away from any regular electricty supply, a place patrolled by bored, nervous members of the United Nations task force MONUC. For all its isolation, Gbadolite astonisingly boasts one of the longest runways in Africa; it was built by Western-supported kleptocrat dictator Mobutu Sese Seko so that Concorde could fly supplies of champagne to his nearby palace. The palace is deserted now. The gold taps went first, apparently. Looted, swimming pools dry, the bush is slowly reclaiming it. I was there to meet child soldiers whom an NGO was trying, with mixed success, to reintegrate back into the society they'd been dragged away from to be forced to become killers. It's quite horrifying to look into the eyes of a child who has almost certainly murdered and raped, or been raped. 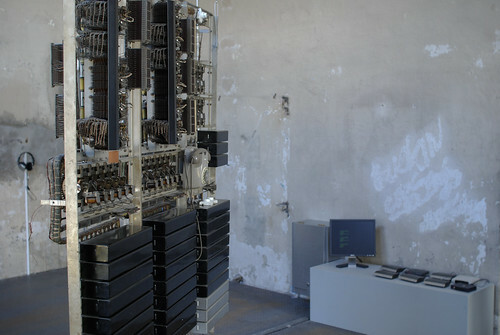 Today I was just posting a listing for transmediale.09 on the main site when I saw that one of the artworks listed for this year's Award is UK artists' Graham Harwood, Richard Wright, and Matsuko Yokokoji's Tantalum Memorial, a work that was exhibited at last year's Manifesta 7. Harwood, Wright and Yokokoji were formerly associated with the digital media collective Mongrel. Tantalum Memorial grew out of a piece of work Mongrel did called Telephone Trottoir. Telephone Trottoir recreated the informal "pavement radio" of Central Africa - the phone calls by which news is passed in opressive states - by creating an audio messaging network for Congolese regugees in London. Tantalum Memorial is an old-style telephone exchange built from Strowger telephone switches to animate the Telephone Trottoir system, dialing up numbers provided by the network of Congolese refugees as the diaspora reconnects with itself, using a technology from before the high tech era of modern digital telephony. It is an analogue response to a largely ignored horror created by our digital era, a tiny act of marking an unmarked holocaust. Though the wars in the Congo of the last 12 years are often portrayed in the media as tribal, arising originally from the spillover from the Hutu and Tutsi conflicts of Burundi and Rwanda, they are more honestly described as being fuelled by the profits from looted minerals. In mineral terms, Central Africa is one of the very richest parts of the world, though none of that wealth was evident among the huts of Gabolite. One mineral in particular has proved lethal to the area: coltan is the colloquial African name for columbite tantalite. Coltan is used to make high-performance capacitors, the sort needed to produce chips for video game consoles, laptops, digital cameras and mobile phones. The Congo has the world's largest coltan reserves. These have been systematically fought over by the new kleptocrats, the warlords, and exported clandestinely via neighbouring countries, Uganda, Burundi and Rwanda. The boom in mobile phone sales coincided precisely with the eruption of what has been the world's bloodiest conflict since WW2. Around 4 million have died so far in the violence and its aftermath. Disease and ongoing violence means that Congolese are still dying at a rate of 45,000 a month. We are technophiles; Tantalum Memorial is a remarkable reminder of the cost of technophilia.